Market momentum has long been proven to be the best predictor of future price movements. SectorSurfer automates the process of selecting the best stock to own — no emotional bias! 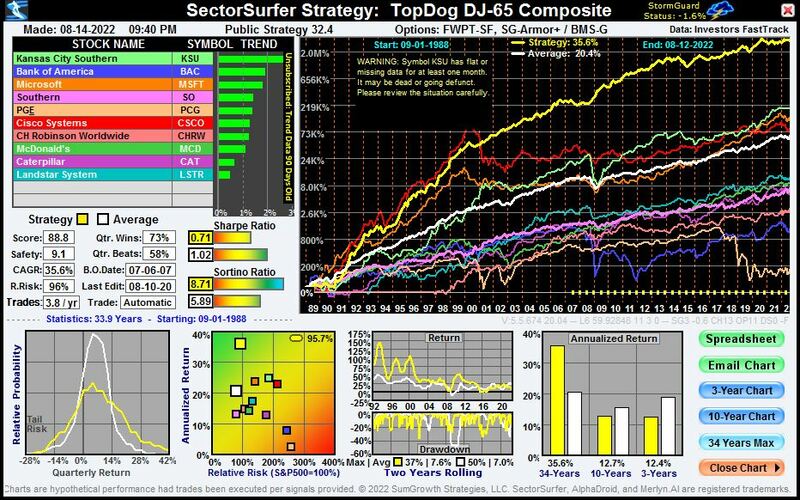 Its high performance trend following sector rotation algorithms keep you in the best stocks during bull markets and its StormGuard TM algorithms move you to the safety of cash during prolonged bear markets. Only by owning the top trend leader and steering clear of the trend laggards can you simultaneously improve returns and reduce the probability of loss. SectorSurfer evaluates your Strategies daily and sends an email Trade Alert when you have trades to make. We also have many high performance mutual fund and ETF Strategies to choose from, or you can create your own Custom Strategy (see how here). If you prefer having personal professional advice, please contact one of our listed SectorSurfing Professional Financial Advisors. SectorSurfer is a trend following trading strategy for stock investment. Each TopDog Strategy is based on a well known Stock Market Index and consists of a selection of up to 12 stocks from that market index. It is SectorSurfer's job to determine which one stock, and only one stock, from the set of 12 to own at any given time. Simply by determining which of the stocks is the top trend leader and owning only that stock for the next month SectorSurfer achieves the performance depicted by the yellow line on the charts below. Click the tabs below to see the TopDog Strategies for the stock market index of interest. To better understand how SectorSurfer Strategies achieve such high performance, please click each of the title-slides above (or the text below each thumbnail image) to review the topic's information in more detail. The charts below have numerous mouse-over hot spots that provide a brief popup text description of the chart object, and many chart objects can be clicked to link to a more complete description. For a more theoretical discussion, please review the Sector Rotation Theory page. For the DJ-65 Dow Jones Composite Index Composed of US Companies. To add this to your My Strategies list, click the icon to open the Select-a-Strategy popup window and select TopDog DJ-65 Composite from the list. 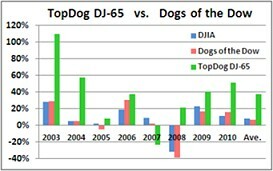 Comparison To "Dogs of the Dow"
The chart to the right compares the TopDog DJ-65 Composite market index Strategy to the well-known "Dogs of the Dow" strategy performance as reported by TheStreet.com. The Dogs of the Dow strategy buys the Dow Jones Industrial stocks that are relatively low in price compared to their 52 week high, but which still pay relatively high dividends. Dogs of the Dow theory says these stocks will more likely perform better in the near future than their peers. Our TopDog Strategies send the Dogs of the Dow back to the doghouse! A stock with TopDog leadership status is a much better predictor of future performance than is a stock suffering with underdog status. Dogs of the Dow theory presumes that stocks are often cyclically punished without cause and will recover. However, stocks are also punished for poor execution unrelated to market cycles. In the end, there is no justifiable reason to own a poor performing stock until it actually is trending higher at a stronger rate than its peers. Only the trend is your friend! For the DJ-30 Dow Jones Industrial Average DJIA Index Composed of US Companies. 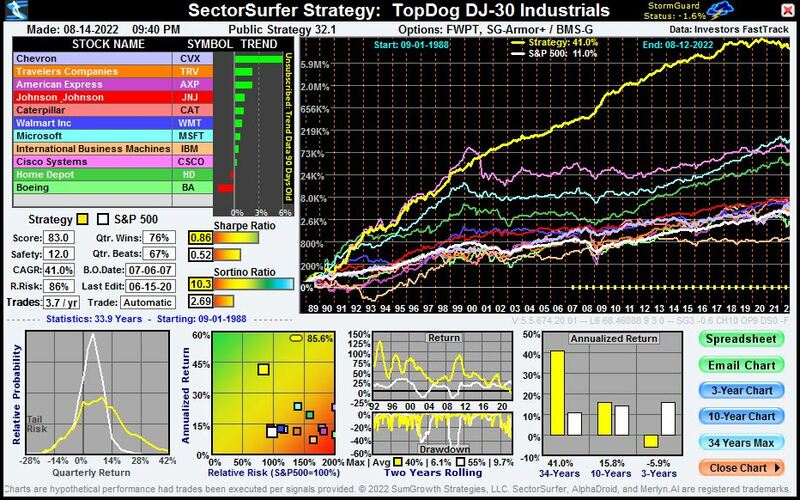 To add this to your My Strategies list, click the icon to open the Select-a-Strategy popup window and select TopDog DJ-30 Industrials from the list. For the S&P-100 Index of the 100 Largest US Companies. 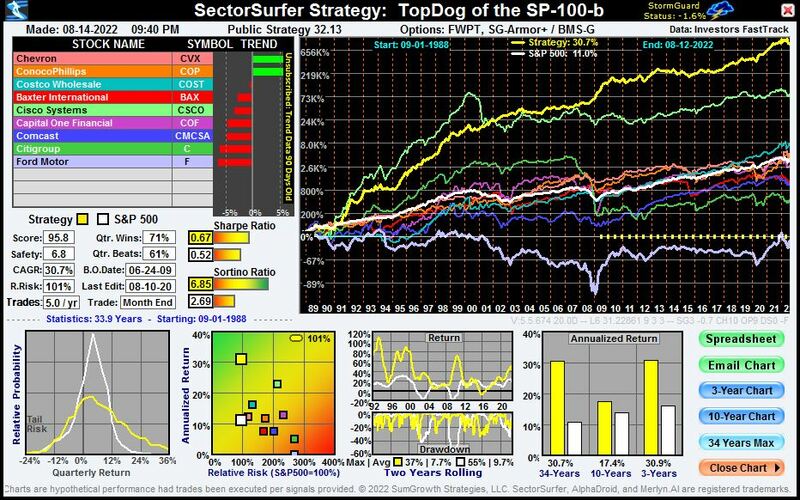 To add this to your My Strategies list, click the icon to open the Select-a-Strategy popup window and select TopDog of the S&P-100-b from the list. To add this to your My Strategies list, click the icon to open the Select-a-Strategy popup window and select TopDog of the S&P-100-d from the list. For the NASDAQ-100 Index of the NASDAQ Stock Exchange. 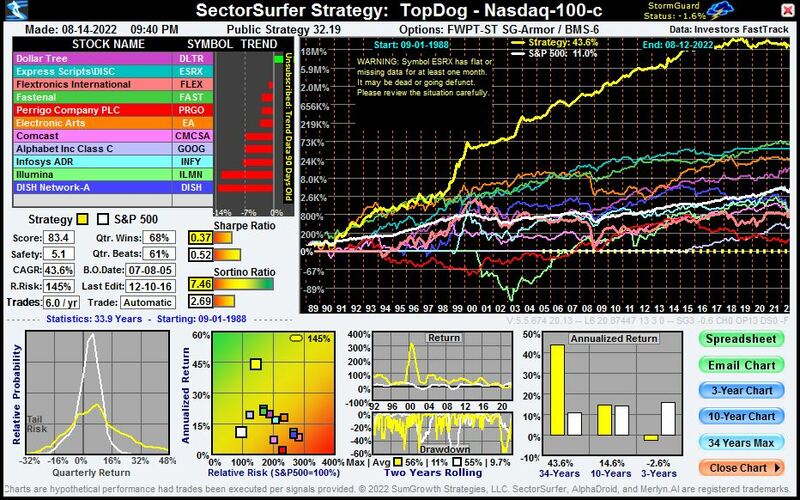 To add this to your My Strategies list, click the icon to open the Select-a-Strategy popup window and select TopDog of the NASDAQ-100-c from the list. 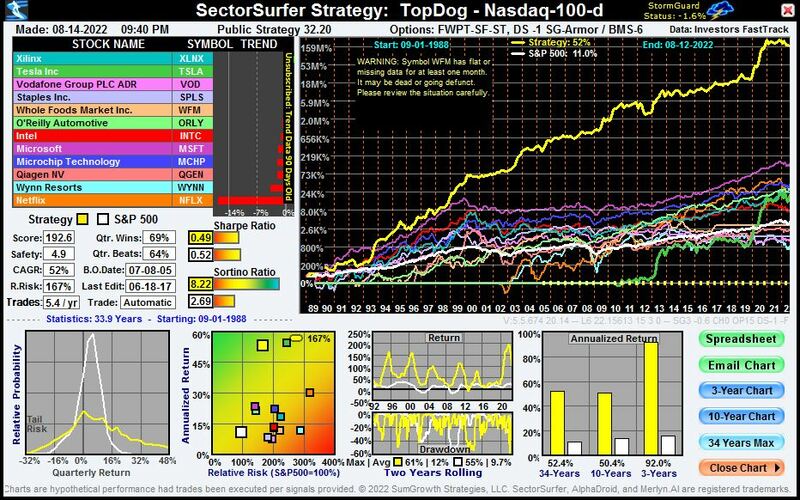 To add this to your My Strategies list, click the icon to open the Select-a-Strategy popup window and select TopDog of the NASDAQ-100-d from the list. Note: Some TopDog Strategies are for stocks traded on exchanges in other countries and may not be available through your brokerage. Note: Individual stocks are more volatile than mutual funds or ETFs as they are not diversified and carry more risk of sharp loss from news about quarterly earnings misses, management scandals, and other adverse events. We strongly recommend use of the Prudent Investor Rule with stock Strategies: To reduce portfolio risk and volatility, invest no more than 20% of your funds in any one stock. That translates into the concept of "Post-Surfing Diversification" — five or more Strategies each selecting one excellent stock. Retired? Employed Elsewhere? Over 591/2? Upgrade your 401(k) to an IRA to Unleash SectorSurfer's True Sector Rotation Potential! You can escape from the paltry performance of your 401(k)'s over-diversified funds by rolling them over into an IRA account where you'll have access to a wide variety of country and sector funds that will unleash the full performance potential of SectorSurfer's True Sector Rotation algorithms. Good returns are required to reduce "retirement risk," which is the risk at age 65 that your savings aren't sufficient and you may have to work longer or reduce your standard of living. While traditional diversification addresses the relatively short term investment risk, its paltry returns can lead to longer term retirement risk problems. Don't win a battle but lose the war. Learn Here how to convert your 401(k) to an IRA. Then check out the many excellent Safety Strategies on our Hall of Fame page. 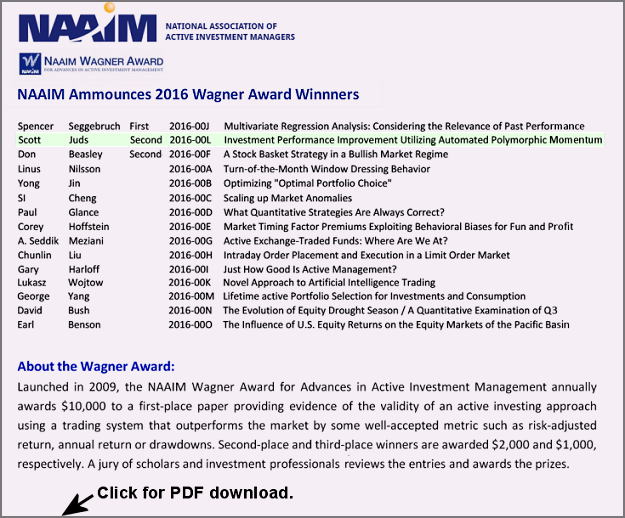 • High performance investment software should be for everyone — not just big Wall Street firms. • Diversification is not a justifiable reason to own poorly performing funds — they hurt your portfolio. 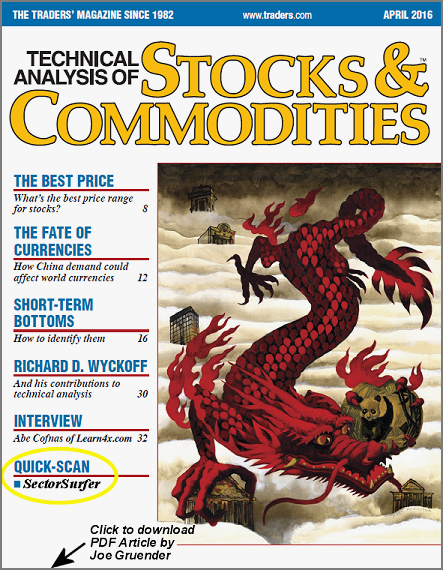 • Great investment advice isn't a fund sorting tool — it's automatically selecting this month's best fund. privately held company with a mission to help individuals improve their retirement prospects by providing state-of-the-art automated investment portfolio analysis and advice.